Washington • As the partial government shutdown continues into its 20th day — nearly tying it for the longest closure in American history — Democrats and Republicans are digging in. Utah’s members of Congress aren’t sure, and while they’re hopeful a solution comes soon, they’re not giving in. Sen. Mitt Romney, R-Utah, isn’t saying if he’d support a bill that doesn’t include the border wall funding that President Donald Trump is demanding. About 800,000 federal workers are affected, with half, like FBI agents and essential employees, forced to work without pay and the other half furloughed with no idea when they’ll be back to work. Democrats, who control the House, have passed bills to reopen the government with $1.3 billion for border security but no funding for a border wall that Trump has demanded. The GOP-run Senate has refused to take up that bill and Trump visited Capitol Hill on Wednesday to firm up support for his wall a day after giving an Oval Office address saying immigration at the U.S.-Mexico border is a major crisis. He seeks $5.7 billion to build a wall. On Wednesday, Trump walked out of White House negotiations with Democratic congressional leaders calling it a “total waste of time” after House Speaker Nancy Pelosi of California and Senate Minority Leader Chuck Schumer of New York refused to give in on his demand for wall funding. Democratic aides said Trump really did say “bye-bye” as he left the meeting in the Situation Room. Schumer later called it a “a temper tantrum” by the president, who he said slammed the table before walking out. “This was really, really unfortunate, and in my judgment, somewhat unbecoming of a presidency," Schumer said. Back on the Hill, little progress was made as Senate Majority Leader Mitch McConnell, R-Ky., said his caucus was unified with Trump — despite some Republicans hedging and saying they’d vote for a bill without wall funding. McConnell has refused to bring that legislation up for a vote. Utah’s lone Democrat in Congress, Rep. Ben McAdams, noted he’d voted to pass a bill that had previous Senate approval to fund the government without money for a wall. McAdams said Congress must work in a bipartisan fashion and stop digging in. 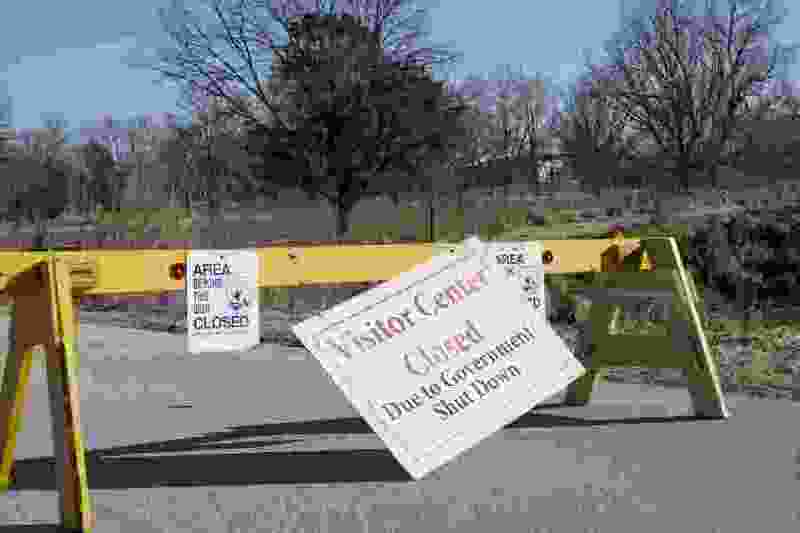 The longest government shutdown lasted 21 days from December 2005 through January 2006 as President Bill Clinton clashed with House Speaker Newt Gingrich over spending cuts. With little action so far, the current shutdown is likely to last even longer. Rep. John Curtis, R-Utah, said Wednesday that he hopes a compromise can be reached soon, though he agrees with fellow Republicans that border security funding is vital to any deal. Members are currently being paid, though some like Curtis and McAdams have asked the House clerk to withhold their pay until the government closure ends. Sen. Mike Lee, R-Utah, said he’s hopeful for a compromise that reopens the government and also builds more walls on the southern border. His office said the senator isn’t going to speculate on whether he’d support a bill that doesn’t include wall funding to get the government up and running again. "We really would have to see the specific spending bill in question before we determined whether or not we would vote for it,” said Lee’s spokesman Conn Carroll. Rep. Chris Stewart, R-Utah, said he's still hopeful that Democrats and Republicans can make a compromise and get the full government running again. Trump had initially called for $25 billion for the border wall during his 2016 campaign but the current dispute is over $5.7 billion. Democrats have offered $1.3 billion in border security funding but not money for a physical wall. Stewart also said that Trump offered a carrot for Democrats by including protections for immigrants brought to America without documents as children, commonly known as Dreamers. Trump pulled that offer before the shutdown. “Democrats have voted for physical barriers and border security under previous presidents,” Stewart said. “I want a deal that includes border security while providing certainty for our Dreamers." Stewart isn't sure, either, what he'd ultimate accept but he has a checklist of mandatory parts of the legislation.